Route type: This tour is a short one around the Agios Pavlos springs. The ascents are steep and require some cycling experience. 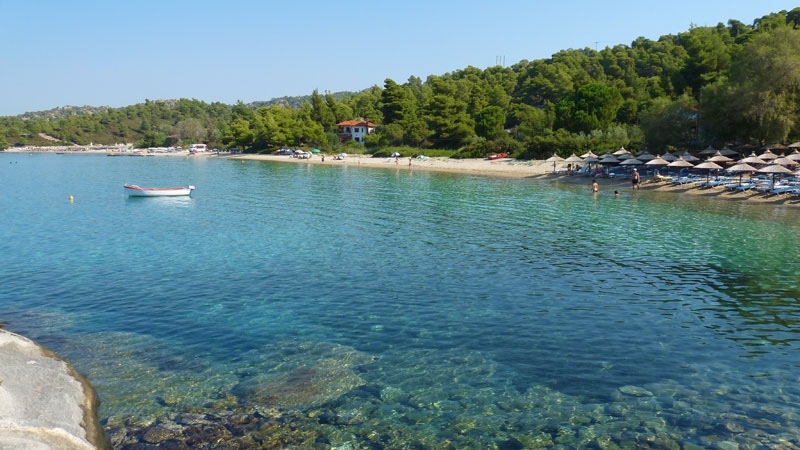 Overview:The tour begins along the coast of the Sithonia peninsula, giving you beautiful views of the sea and affording you opportunities to stop for a swim. A little further down you head inland and upwards. You will have a 300 meter climb ahead of you. The road becomes a mix of gravel and sand with a 20% incline. Take a break along the way to enjoy the view and smell the pine forest that surrounds you. After a few hills, you can be rewarded with a descent through woodlands that lead you to Agios Pavlos. When you get here – try the water, it’s refreshing. From here you go on an paved road back to Kalogria beach. A detailed description with a map is found on page 46 of the Halkidiki Bike Guide, see below.